Fish is popular in Aged Care but can lack flavour. The Tuscan style sauce lifts the fish. Heat oil in a large saucepan and add onion. Cook for 3-4 minutes then stir in water and CONTINENTAL Professional Gluten Free Minestrone Soup Mix. Bring to the boil, add KNORR Pronto Napoli and simmer for 10 minutes. Add cannellini beans and peas and cook for 2-3 minutes or until heated through. Cook hoki fillets in combi oven on 20 percentage steam at 160 degree Celsius for 10-12 minutes or until cooked through. 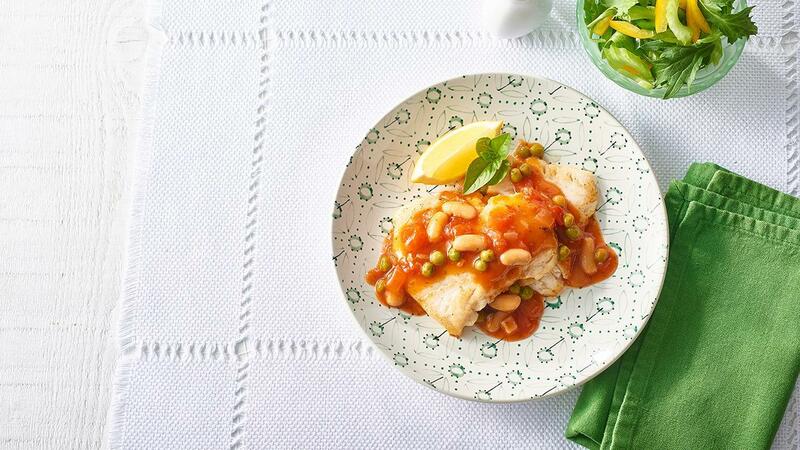 Spoon sauce over fish and serve with lemon wedges and a side salad. Side salad or mashed potato. Use any firm white fish in place of Hoki if desired or pan fried chicken breasts.